Listowel Emmets held their annual Tim Kennelly Tournament at Frank Sheehy Park on Sunday 18th August, where eight teams took part in the competition. Shannon Gaels of New York, Buttevant of Cork, Kenmare from South Kerry along with Ballydonoghue, Beale and Emmets U11 and U12 teams. Billy Keane MC for the day thanked the big crowd for attending and especially all those who travelled over from New York, it was great to see and the Emmets are very much looking forward to the return journey! 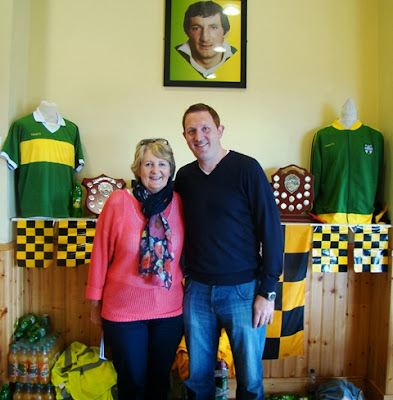 Dara O' Sé special guest was delighted to be in attendance and to be associated with a tournament dedicated to the memory of the late Tim Kennelly who was a special friend to the O'Sé family. 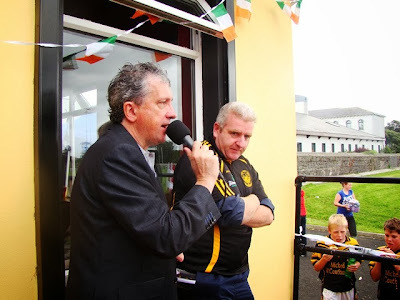 The highlight of the day was without doubt Piper Danny Houlihan playing all eight teams around Frank Sheehy Park before the finals led out by Tim Kennelly's grandson Timmy, who did his family very proud. It was then to the main business of the day, Kenmare and Buttevant topped the A and B groupings to qualify for the A Final while Beale and Shannon Gaels contested the B Final. The C Final saw Ballydonoghue take on the B Team from Shannon Gaels and Emmets U11s and Emmets U12s battled it out for the D Final. After a very close battle in the opening stages Emmets u12's emerged victorious over their fellow Emmets U11's to take the D Final, with Robert O'Brien captain of the Emmets U12's. Ballydonoghue skippered by Jack Kennelly got over Shannon Gaels B team to take the C Final, while Beale overcame a stiff challenge from Shannon Gaels A Team. Tom Murnane's Kenmare side insured victory for the Kerry side over Buttevant of Cork in a thrilling final. The Kennelly family presented each participant with a gold medal, with each winning captain receiving a trophy and all teams that travelled to the tournament received a special plaque to mark the occasion. The Kennelly family thanked everyone for attending and making it such a special day for them and the Emmets club, they thanked in particular all the sponsors who without their support the event would not be possible, all those that helped out with the barbeque, face painting, MC Billy Keane, special guest Dara O' Sé and the organising committee and all the teams that travelled to the tournament. Click on the link below to view full album of pictures from the day.